Decorative Concrete - Counters, driveways, patios, walkways, and more. Residential and commercial property owners are discovering a remodeling secret that uses a material found in almost every home, and business – concrete. Decorative concrete specialists at Tampa Custom Concrete make existing concrete look like wood floors, brick, marble, tile, granite, slate, and more for significantly less than the cost. The best part is the process is non destructive, safe, and environmentally friendly. Concrete can also be easily repaired, waterproofed, and made slip resistant by using Concrete Technology Inc. certified decorative concrete products. Now larger parts of your budget can be spent on your other renovation and repair projects. The possibilities are endless. 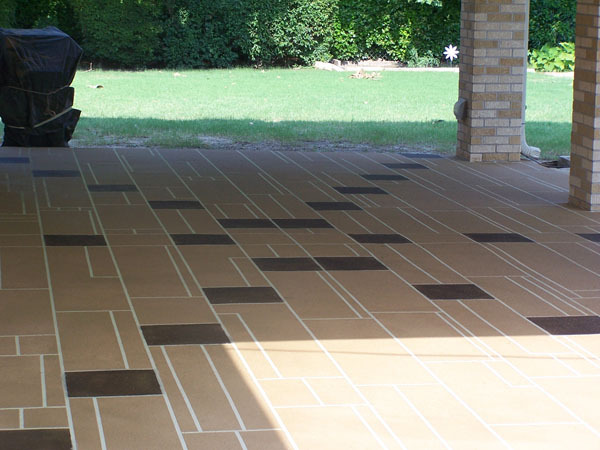 Imagine transforming an ugly basement floor into a mancave complete with colors and logo of your favorite team, or transforming your driveway, or patio with the appearance of brick or tile. How about your favorite logo in your garage? Decorative concrete adds that beautiful finishing touch your residential or commercial property needs to stand out from the rest. At Tampa Custom Concrete, our concrete designs make your property look amazing. We will use our experience to customize a look you’ll be proud to call your own. We offer the latest and the most decorative concrete artistic services. Our specialists first listen to your ideas, and then turn them into reality. Our team members have both artistic and technological expertise. Tampa Custom Concrete will create a unique driveway for you with a beautiful pattern or design. Because we value our customers, we pledge to provide the detailed, dedicated service you deserve. Let your property stand out. Contact us today to learn more about our decorative concrete products and services.